AQD personnel assembled at the TID Conference Room had their hands (and heads) full as they hammered out a strategic plan for AQD from August 13-15. Over the next three days, four workshop sessions were conducted related to the four goals of AQD, namely (1) generate science-based aquaculture technologies and information appropriate for the region; (2) verify, demonstrate and transfer viable technologies; (3) develop, strengthen the capacities of aquaculture sector; and (4) continuously promote the institutional and financial stability of AQD. In this vein, strategic plans of departmental & regional programs, and of the four divisions were presented. Issues and concerns, recommendations and follow-up actions were then tackled by the assembly, which included such topics as climate change and environmental impacts; industrial vs. rural aquaculture; high-volume but low-value species; and administrative and financial concerns. 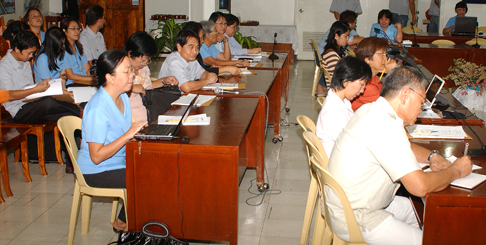 The workshop sessions were facilitated by AQD consultant Mr. Salvador Garbanzos and Dr. Christine Mae Hernando of UP Visayas. Prior to the big event, each concerned division and section met to iron out their individual plans. We facilitate the provision of independent analysis to support expert testimony, regulatory or legislative engagements. Frequently, this work includes economic, financial and statistical studies of varying data analysis, technical and http://www.fidelityadvisory.com.